What is Rational Emotive Behaviour Education (REBE)? REBE stands for Rational Emotive Behaviour Education. It is based on Dr. Albert Ellis' REBT, Rational Emotive Behaviour Therapy. Ellis formulated his unique and revolutionary method of counselling/psychotherapy over his lifetime, using his own experiences of personal fears and anxieties to formulate a philosophy of counselling that has stood the test of time. Ellis was regarded among his contemporaries to be the most significant psychologist of the 20th Century influencing the work of many like; William Glasser, Aaron Beck and Martin Seligman to name a few. Positive psychology is a relatively modern term but the original positive psychologist in my opinion was Albert Ellis who supported many other psychologists and writers with his time and intellect. Dr Ellis supported me and my work for many years and this has helped me to formulate a blueprint for implementing REBE in schools, across the curriculum. The REBE approach is whole school, school friendly and educative. It promotes and reinforces the 7 General Capabilities described in the new Australian Curriculum and replaces the tired and damaging behaviour management system we have struggled to replace over recent years. We have been quick to tell students that their behavioural choices are their own but we haven't I believe effectively taught students how their CONSTRUCTED VIEW of THEMSELVES, OTHERS and the WORLD, their personal philosophies, drive their behaviours and emotions. This is where REBE fills that breach, a system based on constructivist theory designed to educate and not to punish. We have recently hosted Dr Martin Seligman of positive psychology fame as the 'Thinker in Residence.' Many ideas he expounds can be found in the REBE philosophy. It is humbling to know that the greatest (in my view and many others) psychologist of last century knew of and supported efforts to establish REBE in schools in South Australia. Who would have thought that good old Whyalla in country South Australia would be at the forefront of such innovative practice! Follow this link to read about the Grand Opening of The Albert Ellis Professional Learning Centre, pages 6 and 7. REBTOZ thanks the Australian Education Union for supporting our efforts at Stuart High School to teach students how to develop unconditional self acceptance through Rational Emotive Behaviour Education. Positive mental health promotion across all curriculum areas is our aim - behaviour education not behaviour management! 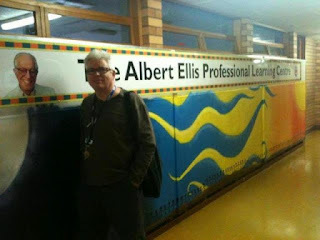 The Albert Ellis Professional Learning Centre Grand Opening - A World First! The Albert Ellis Professional Learning Centre was officially opened at Stuart High School, Whyalla SA on Monday 30/4/12. Ian May Assistant Regional Director, Lord Mayor Pollock, Anne Beinke (AEU) and other invited guests from the local and regional communities attended. Special guest Dr Debbie Joffe Ellis, wife of Dr Albert Ellis creator of Rational Emotive Behaviour Therapy, came from New York to open the Centre. Centre founder, Senior Leader/counsellor Giulio Bortolozzo had a long association with the late Dr Albert Ellis, the creator of Rational Emotive Behaviour Therapy (REBT). Acknowledged as the grandfather of cognitive behaviour therapy and a giant in the field of psychology, his ABC Theory of Emotional Disturbance has been used for decades around the world by mental health practitioners to help people with their behavioural and emotional disturbances. The Albert Ellis Centre is dedicated to providing educators; counsellors and allied professionals REBT based training and development. A particular focus is the application of REBT in the educational context, Rational Emotive Behaviour Education. This is the application of REBT principles and practices across the whole school designed to help students understand how their thinking feeling and behaviour are interconnected. They are taught that events of themselves don’t cause their emotional and behavioural upset but rather it is their constructed view (philosophical beliefs) of themselves, the world and others that do. This insight, taught consistently across all year levels is educative and preventative practice. This supports the counsellor who uses the ABC Theory of Emotional Disturbance, which has been introduced to the students through Rational Emotive Behaviour Education Curriculum. Special guest Dr Debbie Joffe Ellis promotes REBT/REBE across the globe and enthuses that this the first Centre of its type in the world and would have the full endorsement of her late husband, Dr Albert Ellis. She said in a recent interview on Southern Cross TV News that she was overjoyed that this facility has been established to help people, especially younger ones to address emotional and behavioural suffering like anxiety, depression and anger. Stuart High School Principal Veronica Conley has supported this project from its inception and Centre manager Giulio Bortolozzo has valued her strong and determined support. Ms Conley agrees that it is important to share best practice with other schools and educators in the promotion of positive student mental health across all curriculum areas. The Centre has an Outreach Program for schools which may require on-site support to establish the REBE curriculum at their school. Whole day workshops are available to educators, counsellors and allied professionals. June 6th Rational Emotive Behaviour Education for Early Childhood Educators and counsellors. June 20th Rational Emotive Behaviour Education for Primary and Secondary Educators and counsellors.